Natren Bifido Factor Dairy Free Probiotic is step two in Natren's three-step custom probiotic system. This Bifidobacterium bifidum probiotic product provides support for the large intestine. The large intestine serves as the body's waste management and disposal system. It needs specific flora to help it maintain a healthy balance, which the Bifidobacterium bifidum bacteria strain provides. Bifidobacteria prefer to reside along the walls of the large intestine. Each serving of Natren Bifido Factor Dairy Free Probiotic (either 1/2 tsp. 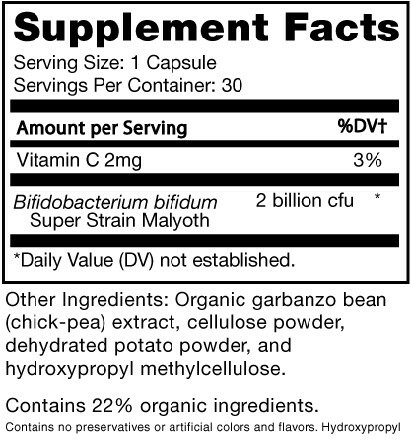 powder or one probiotic capsule) provides a minimum of 2 billion colony forming units (cfu) of Bifidobacterium bifidum Malyoth super strain. Residues and wastes can build up in the colon. Natren Bifido Factor Dairy Free Probiotic probiotic powders and capsules are an effective aid to cleansing the colon. Don't let a sluggish colon make you miserable. 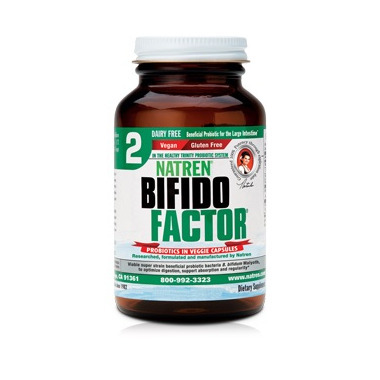 Natren Bifido Factor Dairy Free Probiotic can help keep your colon in optimal working order.